The Westerville Mayor will kick off Thursday's block party to benefit WARM, a community food bank. We will have entertainment, food and fun for every member of the family. 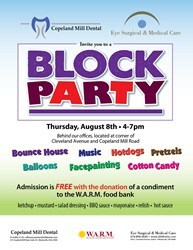 The offices of Copeland Mill Dental and Eye Surgical & Medical Care are hosting a community block party on Thursday, August 15 in honor and appreciation of their patients. The festivities will be held from 4-7pm in the parking lot shared by both practices, located behind the intersection of Cleveland Avenue and Copeland Mill Road in Westerville. "We welcome and encourage the whole community to join us for this fun event," says Dr. Kevin O’Grady of Copeland Mill Dental. "We will have entertainment, food and fun for every member of the family." Dr. Wesley Harnish of Eye Surgical & Medical Care adds, "Our community block party is free with the donation of a condiment to the Westerville Area Resource Ministry (WARM) food bank." The late afternoon event will feature a variety of food offerings, bounce houses, face painting, games and music that will appeal to all ages. Donations of condiments will be accepted in lieu of an admission fee and will benefit the WARM food pantry. In 2012, the WARM food pantry served more than 5,300 families. Copeland Mill Dental provides comprehensive dental care that is focused on the overall health and well-being of every patient. A single team delivers customized dental services and treatment plans that include cleanings and prevention, periodontal care and cosmetic and general dentistry. Visit http://www.copelandmilldental.com or call 614-890-3130 for more information. Since opening in 1989, Eye Surgical & Medical Care has become a leading vision correction and eye surgery center in Central Ohio. Specializing in cataract surgery, refractive surgery, disease management and optometry services, Eye Surgical & Medical Care delivers complete and comprehensive eye care in a safe environment for every patient. To make an appointment or to learn more about the practice, call 614.889.2020 or visit http://www.2020ohio.com.